"Ilios" is an ancient Greek name for Troy. 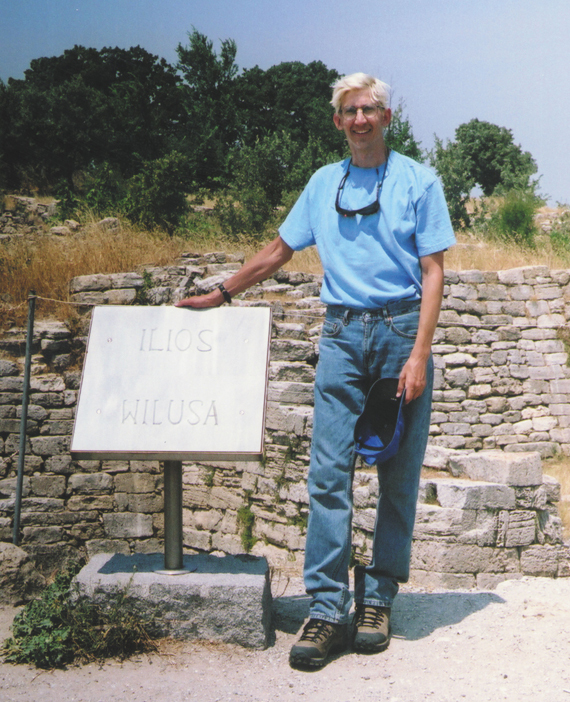 "Wilusa" is the probable Bronze Age Hittite name for Troy. Photo copyright © 2006 Virginia Russell. All rights reserved. Used with permission. It seemed crazy. Somehow the second half of the summer of 2006 had become packed full of plans. Sandwiched between four-and-a-half days behind a booth at North America's largest pop culture convention, San Diego's Comic Con International, and five days behind a booth at the World Science Fiction Convention in Anaheim, California, I was planning four weeks of globe-trotting to destinations that included New York City; Amsterdam; Princeton, New Jersey; Chardon, Ohio; and the place I was most looking forward to: the site of the legendary city of Troy. I've been studying Troy and the Trojan War seriously since 1992. My comic book and graphic novel series Age of Bronze, published by Image Comics, has been retelling the complete story of the Trojan War for all to see since 1998. But I'd never been to Troy before. For my artistic reconstructions of the city I'd been working from books, photographs, maps, and site plans. Guided by information from Frank Calvert, Heinrich Schliemann revealed to the world Troy's location on the Hill of Hisarlık in northwest Turkey in 1870. Project Troia, the current archaeological expedition at Troy, has been digging there every summer since 1988. They'd been originally scheduled to stop digging in 2000. In fact the American arm of the team from the University of Cincinnati, which had been concentrating on post-Bronze Age Troy, stopped digging in 2002. But the joint German-Turkish arm of the expedition, led by Tübingen University, continued investigating the Bronze Age remains under the direction of Prof. Manfred Korfmann, who'd led Project Troia since the beginning. For the past few years I'd grown increasingly anxious to go to Troy, not knowing for sure when the archaeologists would close the current expedition for good. I wanted to see Troy while they were still there, to experience it through their eyes, to hear what they might have to tell me. And as one of the Friends of Troy for a number of years now, I'd hoped to be welcomed and shown some behind-the-scenes sights that the regular tourists don't get to experience. In August 2005 I was shocked to learn that Prof. Korfmann had passed away. I was glad to have met him and hear him speak at a conference in Washington, DC, in 1997. I'd been sending him each issue and book collection of Age of Bronze (multiple copies at his request). And we'd exchanged a small amount of correspondence. But I'd long hoped to meet him again at the site of Troy. That was no longer possible. Korfmann's death, however, spurred me to visit Troy during the 2006 summer dig campaign. I was also reaching a point in the story of Age of Bronze that from a creative standpoint made it necessary for me to finally visit the place I'll be drawing for years to come. The Achaean army had finally left the Greek mainland behind for good and was camped on the island of Tenedos off the coast just south of Troy. Finding reference for my drawings of Tenedos (modern Turkish name Bozcaada) had proven difficult. In addition to Troy and its surroundings, I needed to visit Tenedos, too. My search for a reasonably-priced plane ticket that fit my schedule was frustrating. Project Troia's excavation season in 2006 was scheduled for mid-July through the end of August. I was already committed to exhibiting mid-July at Comic Con International, as I do every year, and to exhibiting in late August at the World Science Fiction Con since, conveniently, it was being held this year close to home in Southern California. I wanted several days in New York City to do research at the New York Public Library as I do every summer. Two family events were also planned for August--the wedding of a cousin in Florida and a 90th birthday party for my grandmother in Ohio. I couldn't manage to fit both family events in. Since I could drive to Ohio from New York, I finally decided to attend the birthday party, a decision bolstered by the fact that my partner David, who'd be joining me in New York, wasn't at all amused by the idea that my cousin had recently converted to Catholicism. Neither David nor I is much impressed by the Catholic Church's oppression of gay people (not to mention its many other oppressions). So although I like my cousin--who I can't imagine having an oppressive bone in her body--the scales came down on the side of my grandmother. David was planning to exhibit at the Munchkin Convention of the International Wizard of Oz Club, scheduled for the 11th-13th of August in Princeton, NJ. I wasn't much interested in attending yet another Oz convention, even though Adventures in Oz, the new compilation of my Oz graphic novel series from IDW Publishing, was scheduled for publication in time for the convention. The final travel schedule, however, left open the possibility of my attending the Munchkin Con. I'd be in New York City that weekend and Princeton is just a short trip away. I scoured the internet for a bargain on plane fare. Summer is the prime tourist season for Turkey, and fares at the time I planned to fly into Istanbul were at least double the off-season fares. Finally, I bid for a ticket on Priceline.com. I've gotten some extremely good fares on internet travel bid sites, but those sites should be approached cautiously. Blinded by my frustration with the high rates on regular airline websites, I wasn't careful enough with Priceline this time and ended up with a ticket for a plane leaving JFK for Istanbul that forced me into an unappealing situation. The ticket cost $1068--lower than any regular fare--but in order to catch that plane in New York I had to buy a ticket for a flight leaving San Diego the day after Comic Con International ended. I'd wanted a full day to recover from the exhausting marathon that's always CCI, but I wouldn't get it this time. At least the flight from San Diego to JFK left in the evening. But the flight from there to Istanbul was scheduled to land at Ataturk airport at 1:30 am. I had no idea what Istanbul would be like at that early hour. I'd have preferred to navigate a strange city in daylight, but that's not the deal I'd ended up with. I decided I'd make the best of it. 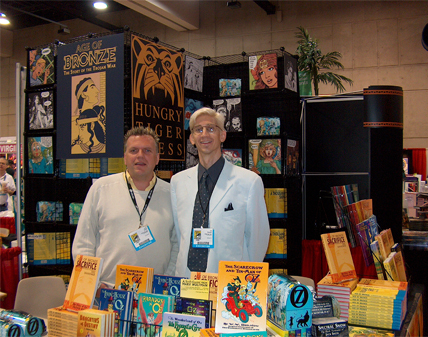 David and Eric exhibiting at San Diego's Comic Con International 2006. Photo copyright © Walter G. Meyer 2006. All rights reserved. Used with permission. On Monday evening, July 24th, David and a couple friends who'd stayed a day after Comic Con dropped me at the airport. I'd packed hastily. Despite my checklist and weeks-long systematic gathering of items to take on the trip, I'd forgotten a number of things. Shampoo. Business cards. Copies of Age of Bronze. I didn't realize this at first. One thing I was quite aware of was that I'd been unable to exchange US dollars for New Turkish Lira before I left. I guess New Turkish Lira aren't much in demand by San Diegans. However, I figured JFK airport would have a currency exchange; surely I'd be able to get New Turkish Lira when I landed at that major hub of international travel. The first exchange desk at JFK didn't have any, but the woman there sent me to a desk that did. Another item I'd planned to pack and forgotten was the book Celebrating Homer's Landscapes: Troy and Ithaca Revisited by Prof. J.V. Luce (who's also an Age of Bronze reader). 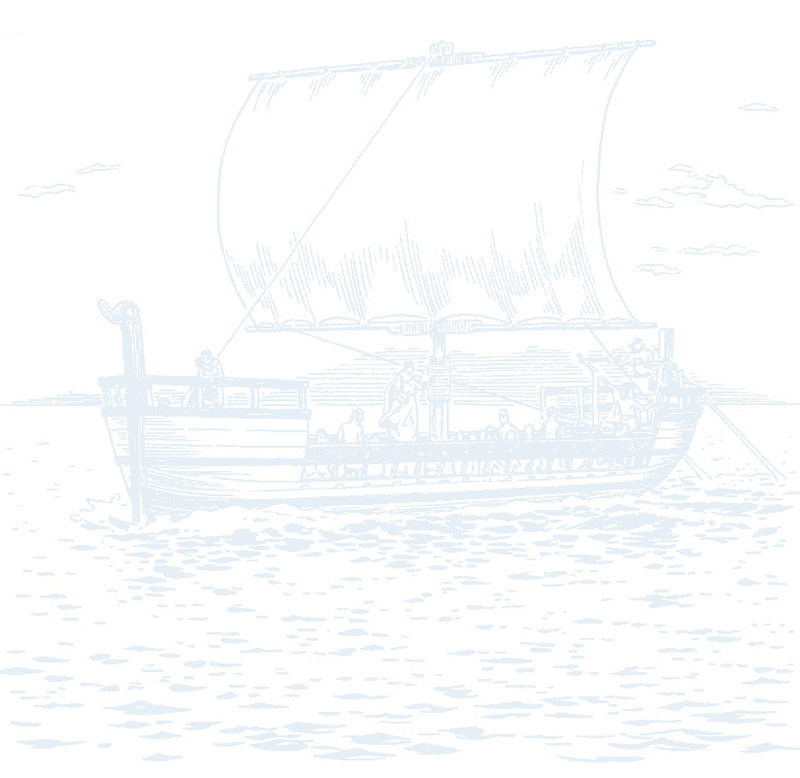 Celebrating Homer's Landscapes is an excellent guide to locations in Homer's Iliad and Odyssey. I figured it would prove useful during my sojourn at Troy. I'd been planning to take photocopies of the pertinent pages since I was determined to pack as lightly as possible. Packing light also meant that I took only four pairs of underwear, five shirts, and four pairs of hiking socks. I'd hoped to wear gym shoes for the plane flights, but I couldn't fit my light hiking boots into my backpack with everything else, so I wore the hiking boots and eliminated all other shoes. I took a bottle of Woolite in order to wash clothes in the hotel room, though I wouldn't be washing the two pairs of jeans I was taking. Denim takes too long to dry, so I planned to wear them on alternate days and hope that they didn't start to smell too bad. Turkey in late summer is a broiling place, so I planned to take one pair of shorts, but I forgot them, too. I don't think that was much of a problem, though. The occasions for wearing shorts while I was in Turkey were few, and due to mosquitoes and thorns, shorts probably wouldn't have served me well. Nevertheless, they would have been cooler! But I'd had no time to make photocopies, and in my hasty packing, I forgot Luce's book. When I realized this on the plane to New York, my stomach sank. Finding and identifying places around the Trojan plain was going to be difficult using only my wits and memory. Fortunately I had about seven hours in New York before my flight to Istanbul, plenty of time to accomplish a few tasks. Including photocopying the pertinent chapters of Celebrating Homer's Landscapes from a copy at the New York Public Library. I also had time there to photocopy Thomas Monro's 1795 play Philoctetes in Lemnos which I hadn't had time to photocopy the year before and couldn't find anywhere else. Also had time to go out to Edgar's on the Upper West Side for a meal with my friend, playwright Edward Einhorn, and to sack out for a couple hours on Edward's couch. (I was still exhausted from Comic Con.) Unfortunately I didn't realize until I got to Troy that I'd forgotten to pack shampoo or I'd have bought a bottle in New York. The computers were down at the KLM desks when I got back to JFK that evening. I stood in a massive line for more than an hour before the airline employees began to pick people out of the line to give boarding passes to. Fortunately I had an e-ticket and no baggage to check, so I was soon relieved of what had been mounting worry and off to the gate. But I hadn't needed to worry much; we sat there on the plane for hours past scheduled take-off, I guess to get all those waiting passengers on board. 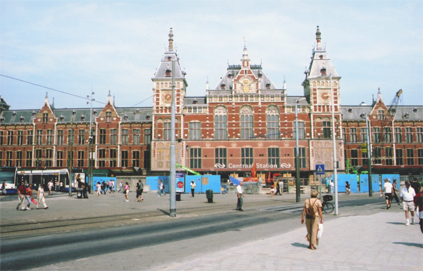 The flight arrived late in Amsterdam mid-morning of the next day. My layover was shorter than I'd expected, but I still had about seven hours to kill. Of course, I didn't plan to just sit in Schipol Airport. I'd never been to the Netherlands before and I wanted to see what I could. Before the trip I'd been concentrating on Troy and Turkey, so I hadn't made any plans for Amsterdam. But Comic Con attracts people from all over the world, so there I asked half a dozen friends and acquaintances what I should do in Amsterdam with only a few hours to see the city. I got more than half a dozen suggestions and followed them all--except for taking a ride in a canal boat (the expense) and visiting the comic store Lambiek (didn't find it). The Rijksmuseum is under renovation, so most of it is closed, but I got to see many paintings by Rembrandt and others and, really, what was there to see filled the available time quite nicely. I had a meal and strolled along the canals. The architecture in Amsterdam is fascinating, not the least of which are the many buildings that lean over at alarming angles. On the flight from Amsterdam to Istanbul I sat between a Turkish woman who was returning to Turkey for a visit after many years living in Canada and a Dutch woman returning to her home of 30 years in Istanbul after a visit with old friends in Amsterdam. I'd downloaded The 100 Most Useful Words in Turkish from the extremely helpful website Turkey Travel Planner and had been trying to learn as many of the words and phrases as I could. But the Turkish language is so alien to the English language. It's not like Spanish or French which share Latin as a common ancestor with English. Turkish is completely different, and the only Turkish word I could remember was "merhaba," that is, "hello." Useful, you'll admit, but not going to get me very far. The Turkish woman helped me a bit with pronunciation and taught me one of the most useful phrases I used in Turkey, "kaç para?" --"how much money?". She was also the first Turk of many to express surprise that I wouldn't be spending time in Istanbul. I wanted to spend all my time in Troy and had only left room in my plans for maybe a day in Istanbul at the end of the trip, primarily to insure that I was back in Istanbul in plenty of time for my return flight to the USA. When I told her I was going to Troy, she didn't know what I was talking about, merely the first Turk to reveal a lack of knowledge about Troy's history. That surprised me. However, she quickly realized that what I meant by "Troy" she knew as "Truva," the Turkish name for the site. At her prompting I had to admit I had no plans to visit other archaeological sites, neither Ephesus nor Pergamum, both with far more remains, far more spectacular and tourist-friendly than little Troy. This led to my explaining that I draw a comic book version of the Trojan War. And that was the moment I realized that I'd forgotten to bring any examples of Age of Bronze with me. I did have the photocopies of Luce's book to show her, which at least presented evidence of my enthusiasm for Troy. I'd been far too busy the weeks before I left San Diego to drive up to Los Angeles and obtain a visa for Turkey at the consulate. My understanding was that Turkish tourist visas would be readily available for $26 USD at Ataturk airport in Istanbul. That information turned out not to be completely trustworthy. I obtained a visa at the airport without any trouble, but it only cost $20. By 2 am I was through Immigration and Customs, neither any sort of problem. I went in search of the Metro, only to find that it wouldn't start running until 6 am. So I sat in the airport for four hours. It gave me time to re-read the pages from Luce's book and to plan the geographical points near Troy I was interested in visiting. At 6 am I took the Metro to the Otogar stop. "Otogar" is Turkish for "bus station." I expected to find it immediately at the top of the stairs out of the Metro, but I couldn't find it. I wandered around the building above the Metro station, searching for a ticket office. Nothing. Only a rather dirty mall. I asked at the Metro ticket office, but the attendant either couldn't understand my rudimentary Turkish or else didn't want to help me. The same thing at the window of a police office. I'd stepped outside the mall a couple times during my search. There were what appeared to be local city bus stops surrounding the mall, but no visible place to buy tickets. On the other side of the circular street surrounding the mall were what I took to be storefronts, but I paid them little attention. At last a man came up to me in the mall and asked in English where I wanted to go. I told him I wanted a bus for Çanakkale, the large town 25 kilometers away from Troy. He rattled off a couple numbers. I had no idea what he meant, so seeing my incomprehension, he led me outside and pointed to the ring of storefronts. There were perhaps two hundred in the ring around the Metro station, each one numbered, each one with signs listing Turkish towns on the front. Now it made sense--each storefront was a bus company! More men began to approach me, asking my destination and indicating stations with signs that listed Çanakkale. I chose one at random--Radar--bought a ticket, purchased something to eat while I waited, and was soon on a bus heading southwestward toward Troy. The major bus lines in Turkey are quite nice. The service is much like an airline. Each bus has a steward who hands out beverages and snacks. He checks the passengers' tickets, and once during each trip I made between Istanbul and Çanakkale, poured a scented liquid into everyone's cupped hands. The other passengers patted this over their hands and faces, so I did the same. Refreshing enough. In my experience the bus stewards are attentive, and on my trip to Canakkale the steward, Naim, was extremely attentive to me even though he spoke almost no English and I spoke almost no Turkish. By the time the bus reached the ferry at Eçeabat, across the Dardanelles from Çanakkale, we'd become pretty good friends. While the bus rode the ferry, we got off and went up a deck and had tea. People have tea all the time in Turkey. It's just the thing they do. They call it "çay" (pronounced "chai"). I had a lot of çay while I was there, not because I like it--I never drink tea at home--but because I didn't want to insult anyone by refusing. 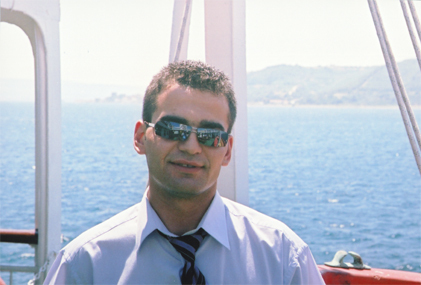 Naim on the ferry crossing the Dardanelles. When the bus drove off the ferry on the farther shore, Naim trotted me over to the bus office where I could get a minibus to another minibus (dolmuş in Turkish, pronounced "dol-moosh") that would take me to Troy. The last I saw of Naim he was grinning and waving good-bye as he stood in the open door of the bus as it swung around to get in line for the return ferry. Thank goodness I had a minibus to take me to the dolmuş station. Although I had directions, I'm not sure I'd have been able to find it as a new arrival in Çanakkale, even though it was broad daylight. Once there it was easy to find the right dolmuş since it said "Truva" in big letters across its front. Each dolmuş has a nominal schedule, but it seems they don't go until they're pretty full. So I waited in the heat on the dolmuş--not so much a minibus as what we'd call a van--studying my Turkish phrase book as the dolmuş gradually filled with passengers. We took off for Troy. I watched our progress through the front window, and when we turned off the highway at a sign that indicated that Troy was 4 kilometers ahead, I kept craning my neck to catch my first sight of Troy. I didn't get it yet, though. We went through a little country town, then another, and at the end of the second one, the driver indicated we'd arrived at the Hisarlık Hotel, the place I'd told him I wanted to get off. So I got off. I crossed the street to the hotel, and when the cleaning woman found the manager, Mustafa Aşkın, I pulled out my print-out of his e-mail confirming my reservation. Everything seemed a little confused. Although I had a reservation, there wasn't actually a room set aside for me. However, there were plenty of rooms available. Most of the time I was there, I was the only guest staying at the hotel. The cleaning woman took me up to the second floor where there was a balcony at the front of the hotel overlooking the road. Six or seven room doors gave onto the balcony and on each door was the name and face of a character from the Trojan War story. She gave me my choice, a room with air conditioner for 25 euros a night or a room without for 20 euros. I'd been quoted 20 euros, that's what I'd planned on paying, so that's what I took. I also had the fleeting thought that they didn't have air conditioning in the Bronze Age, and since I was here to experience the place in order to help in my creation of Age of Bronze, I didn't really want an air conditioned room. I also thought that it was good that I was traveling without David--he'd have been miserable without air conditioning in the summer heat of western Turkey. My room was the Priam room, number 7. Inside I cleaned up a little, changed the clothes I'd been wearing since Monday evening (it was now Thursday afternoon), and went downstairs. 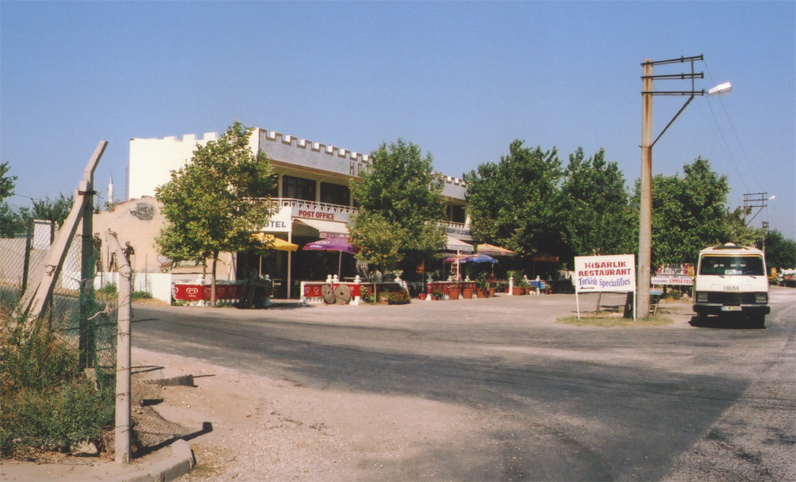 The first floor of the Hisarlık Hotel is mainly a restaurant and gift shop. There I met Mustafa's brother, Hasan Aşkin. He immediately sold me an English language copy of Mustafa's book, A Revised Edition: Troy. This guide to the site is actually better than the official Troy guidebook by Prof. Korfmann. I'm not the only one (besides Mustafa himself) who thinks so. If you visit Troy without having done years of research beforehand like I have, I absolutely recommend that you buy a copy to help you understand the site. After Mustafa graciously signed my copy of his book to me, I walked across the street to the entrance to Troy. I bought a ticket, walked up the 600 meter drive, and there it was. A giant wooden horse. The horse was put there, so I'm told, in the late 1970s or early 1980s. It's a hit with most of the tourists. But I'd seen more than enough photos of this bit of trumpery and had no interest in it. I headed straight for the ruins. The first thing I came upon was the southeast tower of Troy VI with the most visible portion of the Troy VI citadel circuit wall beyond it. Here it was. Troy of the Trojan War. Emotion did not sweep over me. I felt no overwhelming fulfillment. It was just what I'd expected, pretty much as I'd seen in photographs so many times. I was faintly disappointed that it didn't seem like a dream come true. But I didn't waste time on vague disappointments--I was in Troy and determined to make the most of my time there. I'd brought a 35 mm camera with a dozen rolls of film and a camcorder with seven digital video cassettes, and I began to put this equipment to use. 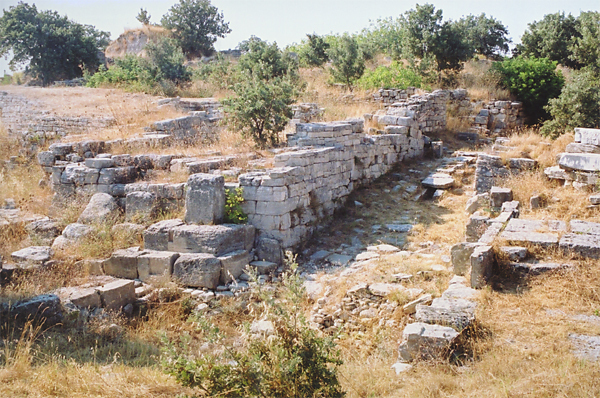 The remains of the Southeast Tower of the sixth settlement of Troy. into the background toward the East Gate. I walked into the citadel through the East Gate of Troy VI and up to the high point where the Temple of Athena from Troy IX used to stand. To the west I could see faintly the island of Imbros. 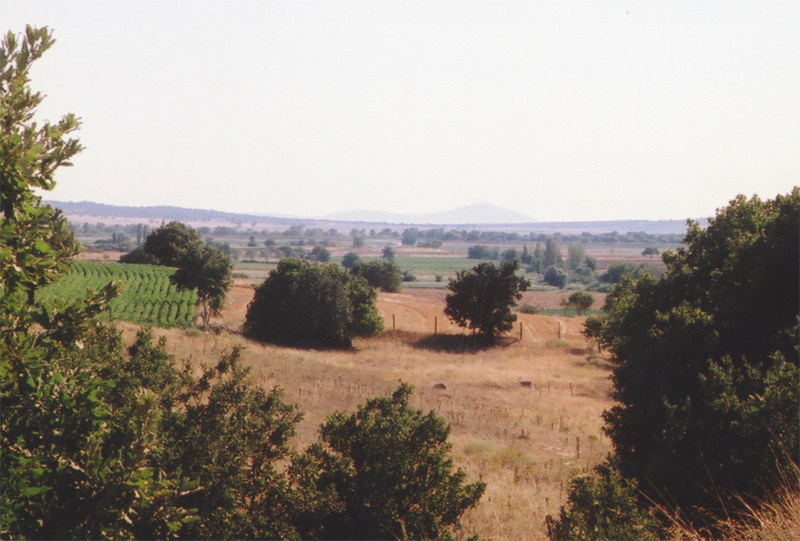 To the southwest the island of Tenedos (Bozcaada) rose over the horizon of the Troad. I wished the view were less hazy, and hoped that it would clear a bit while I was visiting Troy, but that first day was actually the clearest view I had. Each day became increasingly hazy until on the morning of my last day there the haze was so thick it was like fog. One thing both Homer and Korfmann are absolutely right about--Troy is windy. Exactly like the descriptions in Homer's Iliad. Exactly the condition Korfmann claimed helped create Troy's control of the trade route to the Black Sea. The wind blew nearly constantly and steadily from the northeast the entire time I was there. After taking photos of the plain to the east, north, and west, I turned back to look at the eastern circuit wall and Tower VI H again, and went on from there, around the citadel the opposite way that tourists are supposed to go. The south gate, which I'd drawn Priam and Helen entering in issue #10 of Age of Bronze, is pretty well preserved and I stopped before it to take a plethora of photos. I wished I could touch it as I'd drawn Helen doing, but it was beyond the wire erected to keep tourists back. As I continued through the site I kept passing tourists going in the opposite direction--the correct direction--but I didn't care that I was advancing against the flow. I wasn't there to be a tourist, I was there to absorb all I could of the remains of Troy VI and VII, the Late Bronze Age levels of the nine primary building phases identified by Schliemann's architect and successor in excavating Troy, Wilhelm Dörpfeld. with the stelae in situ just to the left of the gate in front of the South Tower. 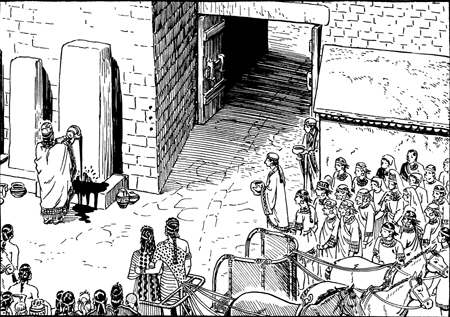 Priam, Helen, and company before the South Gate in Age of Bronze. What I'd not received from my research in books, magazines, video, and the internet was the impression of how large the citadel really is. It's bigger than I expected. So many books have mentioned how the Troy VI citadel is so puny in contrast to the descriptions of the glorious city in Homer's Iliad. So I'd expected it to seem small. Site plans make it look as though you could walk around the Troy VI citadel in less than five minutes. But I don't think you could unless you ran pretty fast. In contrast, when later I explored the area where the Late Bronze Age Lower Town of Troy used to be, it seemed much smaller than I'd expected. That first day I wasn't satisfied with only seeing the citadel; I wanted to see everything I could. So I struck off on paths leading away from the citadel to see what I could find. Many people take the time to go down to the spring cave, and I did, too, making a sketch of the entrance, but most don't venture across the steep northern face of the citadel mound. There on the other side of the fence begin the fields of the local Turkish farmers. On the road that skirts the fence I saw the first of many herds of goats, guided along by their goatherd. I kept circling around the hill, looking up in search of the famed northeast bastion of Troy VI, but I couldn't locate it through the trees covering the north face of the hill. The sun was going down and it was after 7 pm, closing time for the site. I hurried back around and up the hill toward the exit, but I stopped at the excavation team area. I'd e-mailed Dr. Peter Jablonka, one of the excavators who has worked at Troy since the site re-opened in 1988. I'd never met Dr. Jablonka before, but I had met Prof. Elizabeth Riorden a couple times, first at a 2004 Smithsonian symposium on Troy and then again briefly last November when I lectured on Age of Bronze at the University of Cincinnati. In our recent exchange of e-mail messages, Liz had offered to give me a tour of Troy on July 29th. It was, however, still the 27th, so I had no idea whether anyone who knew I had planned a visit was as yet conscious that I might be there. I peered over the fence into the excavation team area. There was no knocker or bell on any of the gates. Signs indicated no admittance. I didn't want to just start calling out randomly, but through the trees I saw some movement. I circled around to a spot with better visibility and where I could be seen. At first I saw no one else. Then a man walked into view. When he saw me he approached and asked what I wanted. I explained who I was and asked whether Liz Riorden was around. No, Liz was in Çanakkale and wouldn't be back in Troy till the next day. This gentleman, however, was aware of my work and invited me in. He introduced himself as Rüstem Aslan--Dr. Rüstem Aslan of Tübingen University--a name I recognized immediately from Studia Troica, the annual volume published in conjunction with Project Troia. We strolled past the pottery tents and sat down at a picnic table where he gave me some water--no çay this time, even though Rüstem is Turkish--and we talked about Troy and the Trojan War. He asked what I planned to see while there. I told him that besides hiking around the area immediately surrounding Troy, I wanted to visit Mt. Ida and the island of Tenedos. Rüstem had a few suggestions about getting to Mt. Ida (Kaz Daği), but without a car, my going there began to seem a little impractical. His information about Tenedos (Bozcaada) was more encouraging. Each August for the past five years, the journalist Haluk Şahin has organized The Day of the Poet and the Reading of the Iliad, an event that includes a public reading of Homer's Iliad on the beach at sunrise. I'd seen information about the event on the internet, but hadn't realized that this year it would coincide with my visit to Turkey. I wanted to participate if possible. Rüstem introduced me briefly to Dr. Ernst Pernicka of Tübingen University, the current director of Project Troia. But I didn't want to overstay my welcome, especially since I'd dropped in unexpectedly, so I returned to the Hisarlık Hotel and had dinner. During dinner the sun went down. With sunset came the mosquitoes. The mosquitoes were probably the worst part of my trip to Troy. I'd brought bug repellant containing about 25% DEET, but it was not completely effective at keeping the mosquitoes from drinking my blood. In fact, the repellant ran out two days before I left, and I noticed no difference at all in mosquito attacks. They were worst at night. Since my room had no air conditioner, I had to sleep with the window open. The window had a screen, but the screen had rips in it rather ineffectively blocked. And I found after a day or so that the door of my hotel room did not fit correctly into the door-frame, leaving a gap near the top plenty large to admit flocks of mosquitoes any moment they took a fancy to enter. Despite the heat, I slept under a sheet every night, wrapping it over my head, letting only my face peep out, trying to minimize my exposed skin surface. Nevertheless, most nights between 3:00 and 4:00 in the morning I'd wake, unable to stand it any longer, and go on a mosquito-killing spree. The ones that had already feasted were easy to kill, resting bloated and lazy on the wall. But I never could kill all the mosquitoes in the room. Worst were the ones that fled beneath the bed. They seemed to know that I couldn't find them under there, where they lurked, waiting for me to turn the lights off and get back into bed before they resumed the attack. My hands seemed to be a favorite target when they'd slip from beneath the covers while I slept. One day I counted more than a dozen mosquito bites on one hand. But worst was the morning I woke up with the most massive mosquito bite I've ever seen on the side of my nose. Fortunately my glasses helped conceal it so I wasn't a fright in public. Despite anything that might give an impression to the contrary, for any visit to Troy longer than a day I'd recommend staying at the Hisarlık Hotel. If you don't need luxury, it's a perfectly pleasant place to stay, simple but clean. The location--directly across the street from Troy--absolutely can not be beat and more than makes up for anything it lacks. 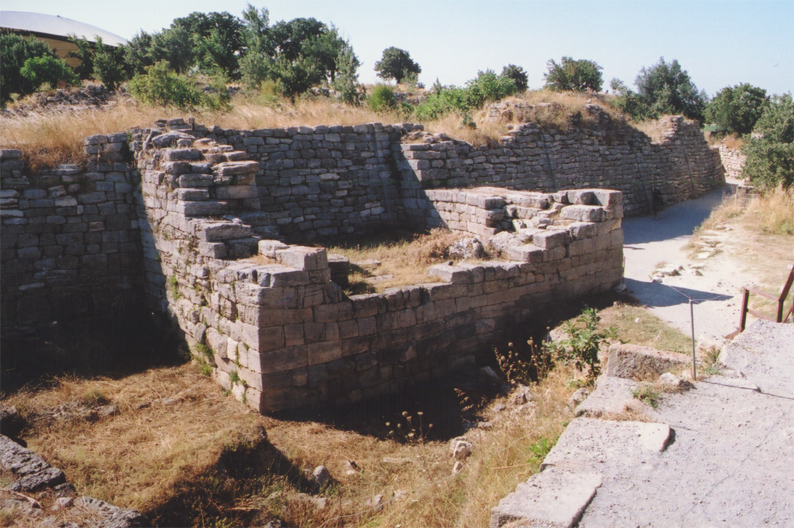 The manager, Mustafa Aşkın, offers guided tours of Troy in English, German, and Swedish. He was born in the small town adjacent to Troy, Tevfikiye, and when the archaeological team isn't around, Mustafa is the most knowledgeable person about Troy in the area. I heard portions of Mustafa's tours on several different days at Troy and I'll vouch for their excellence. Also for his patience with rude tourists (particularly those from the USA). If you're visiting Troy for the day and you get hungry, the restaurant at Hotel Hisarlık serves decent food at reasonable prices. The gift shop sells lots of tchotchkes like little wooden horses, the kind of tourist stuff I have no interest in, but I was able to buy film, maps, guidebooks, and postcards there. It wasn't until the morning after my first night that I realized I'd forgotten to pack shampoo. Unfortunately the Hisarlık Hotel doesn't sell shampoo. Copyright © 2006 Eric Shanower. All rights reserved.